Khodabakhsh, Peyman, Mashayekhi, Samira, Khodabakhsh, Pooria. (1396). Energy Efficiency Policies in Urban Planning System, The Case of Iran. معماری و شهرسازی آرمان شهر, 10(20), 49-62. Peyman Khodabakhsh; Samira Mashayekhi; Pooria Khodabakhsh. "Energy Efficiency Policies in Urban Planning System, The Case of Iran". معماری و شهرسازی آرمان شهر, 10, 20, 1396, 49-62. Khodabakhsh, Peyman, Mashayekhi, Samira, Khodabakhsh, Pooria. (1396). 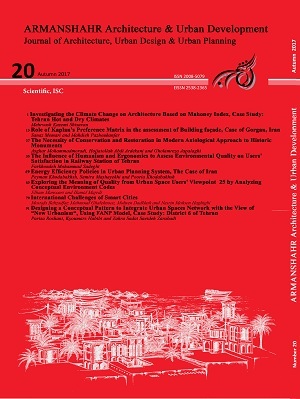 'Energy Efficiency Policies in Urban Planning System, The Case of Iran', معماری و شهرسازی آرمان شهر, 10(20), pp. 49-62. Khodabakhsh, Peyman, Mashayekhi, Samira, Khodabakhsh, Pooria. Energy Efficiency Policies in Urban Planning System, The Case of Iran. معماری و شهرسازی آرمان شهر, 1396; 10(20): 49-62. 2M.A. in Urban & Regional Planning, Faculty of Art and Architecture, Science and Research Branch, Islamic Azad University, Tehran, Iran. Urban areas are the main consumers of energy resources with a considerable amount of waste in building and transport sectors. This comes about due to inefficient development patterns as well as consumption habits. Towards steering an energy efficiency transformation in cities, it is thus crucial to develop policies, strategies and measures to improve efficiency in these sectors. Hence, not only physical but also climatic as well as socio-economic characteristics should be taken into account in development of energy efficient urban areas. The respective urban development factors- besides technological applications and organizational readiness- can support better energy performance of cities. Against this background, the present research emphasizes on identifying energy efficiency planning measures together with their integration in local urban development practices. In terms of methodology, the research investigates relevant theoretical knowledge in urban sustainability and energy efficiency and develops a comprehensive set of spatial planning measures to be analysed in the Iranian context. Furthermore, Iranian urban energy facts and figures are surveyed in line with current practical procedures and bottlenecks in the local planning context. The methods used to examine the local context are diverse and include: via desk research, field observations and interviews with local experts. Besides, GAP analysis is utilized aiming at identifying the existing gaps from technical, regulatory as well as organizational perspective. This is followed by a comprehensive set of strategies and recommendations for the integration of the missing spatial energy measures in the local planning practice.anning practice. Ashworth, G. (1974). Natural Resources and the Future Shape of Britain. The Planner, 60(7), 773-778. Beaumont, J R., & Keys, P. (1982). Future Cities: Spatial Analysis of Energy Issues. Chichester: Wiley research studies Press. Behrendt, S., Pfitzner, R., Kreibich, R., & Hornschild, K. (1998). Innovationen zur Nachhaltigkeit: Ökologische Aspekte der Informations-und Kommunikationstechniken. Berlin: Springer. Bolstorff, P., & Rosenbaum, R. (2007). Supply Chain Excellence: A Handbook for Dramatic Improvement Using the SCOR Model. 2nd edn. Ed. New York: AMACOM. Brandon, G., & Lewis, A. (1999). Reducing Household Energy Consumption: A Qualitative and Quantitative Field Study. Journal of Environmental Psychology, 19(1), 75-85. doi:10.1006/jevp.1998.0105. BRE (Building Research Establishment). (1975). Energy Conservation: A Study of Energy Consumption in Buildings and Means of Saving Energy in Housing. Garsston: S.n. Burchell, R.W., & Listokin, D. (1982). Energy and Land Use. Piscataway: Center for Urban Policy Research, Rutgers, the State University of New Jersey. Entrop, A.G., & Brouwers, H.J. (2010). Assessing the Sustainability of Buildings Using a Framework of Triad Approaches. Journal of Building Appraisal, 5(4), 293-310. doi:10.1057/jba.2009.36. Farahmandpour, H., Nasseri, I., and Hourijafari, H. (2008). Analysis of Ultimate Energy Consumption by sector in Islamic Republic of Iran. Cambridge: In: 3rd IASME/WSEAS International Conference on Energy & Environment, University of Cambridge. GEA. (2012). Global Energy Assessment - Toward a Sustainable Future. Cambridge: Cambridge University Press. Grubler, A., Bai, X., Buettner,T., Dhakal, S., Fisk, D. J., Ichinose, T., Keirstead, J. E. Sammer, G., Satterthwaite, D., Schulz, N. B., Shah, N., Steinberger, J., and Weisz, H. (2012). Chapter 18 - Urban Energy Systems. In Global Energy Assessment - Toward a Sustainable Future. Cambridge: Cambridge University Press, 1307-1400. Hall, D. (1979). The Way Ahead: Practical Proposal for Action by Planners. London: in Proceeding of a Symposium on Energy Policy and Local Planning Council for the Protection of Rural England. Hamidi, S., & Ewing, R. (2012). Residential Energy Consumption App. Salt Lake City: University of Utah. Hegger, M., Fuchs, M., Stark, T., & Zeumer, M. (2007). Energie Atlas: Nachhaltige Architektur. München: Institut für international Architektur-Dokumentation GmbH & Co. KG. Hejazi, S.J. (2003). Quality Urban Regeneration, Coordinated Professional Leadership and Integrated Urban Management in Western Europe: Learning from European Experience in Relation to the Iranian Context. Newcastle: Newcastle University. Hemmens, G. (1967). Experiments in Urban form and Structure. Highway Research Record Number 207, 32-41. IEA-WI (Iran Energy Association and Wuppertal Institute for Climate, Environment and Energy). (2009). Energy Scenarios for Iran. German-Iranian Cooperation Project. Retrieved December 10, 2017, from https://mohssenmassarrat.weebly.com/uploads/3/3/8/9/3389565/report1_final_6april09.1.pdf. Keplinger, D. (1987). Site Design and Orientation for Energy Conservation. Ekistics, 269, 177-180. Khodabakhsh, P. (2017). Analyzing the Impact of Social Infrastructure Planning on Energy Efficiency (Considering the Smart Cities Approach). Germany: TU berlin (Under publishing Ph.D. study). Kim, J., & Moon, J. (2009). Impact of Insulation on Building Energy Consumption. Building Simulation, 2009, 1075-1082. Ministry of Energy. (2013). Energy Balances. (1987-2013). Tehran: Power and Energy Planning Department, Ministry of Energy of I.R.IRAN. MoE (Ministry of Energy) Deputy for Power & Energy Affairs, Power & Energy Planning Department. (2006). Energy in Iran 2006. Tehran: Iran Ministry of Energy. MoE (Ministry of Energy), Deputy for Power & Energy Affair, Power & Energy Planning Department. (2009). Iran and World Energy Facts and Figures, Tehran, Iran Ministry of Energy. Moshiri, S., & Lechtenböhmer, S. (2015). Sustainable Energy Strategy for Iran. Wuppertal: Wuppertal Institute for Climate, Environment and Energy. MRUD. (2012). Urban Development and Architecture Laws and Regulations and Approved Master (Comprehensive) Plans by the Supreme Council of Architecture and Urban Development Until 2009. Tehran: Ministry of Road and Urban Development, Secretariat of Supreme Council of Architecture and Urban Development. Odell, P R. (1977). Energy and Planning. Town and Country Planning 45, 154-158. Odell, P. R. (1975). The Western European Energy Economy: Challenges and Opportunities. Londone: Athlone Press. Ouhajjou., N., Loibl, W., Fenz, S., & Tjoa, A.M. (2016). Advances and New Trends in Environmental and Energy Informatics: Multi-actor Urban Energy Planning Support: Building Refurbishment & Building-Integrated Solar PV. Advances and New Trends in Environmental and Energy Informatics. Progress in IS. Springer, Cham, 157-176. Owens, S E. (1984a). Energy and Spatial Structure: a rural example. Environment and Planning A, 16, 1319-1337. Owens, S E. (1984b). Energy Demand and Spatial Structure. Energy Policy and Land Use Planning Eds, Pergamon Press, 215-240. Owens, S.E. (1986). Energy, Planning and Urban Form. London: Pion. Pahl-Weber, E., & Schwartze, F. (2014). Future Megacities 5: Space, Planning and Design. Integrated Planning and Design Solutions for Future Megacities. Berlin: Jovis Publications. ISBN 978-3-86859-277-1. Pahl-Weber, E., Seelig, S., Ohlenburg, H., & Kuhla von Bergmann, N. (2013). Urban Challenges and Urban Design Approaches for Resource-Efficient and Climate-Sensitive Urban Design in the MENA Region. 5, Young Cities Research Paper Series, Berlin. Palmer, N., & Mooney, L. (2007). Building a Business Case for BPM– a Fast Path to Real Result. Open Text Corporation. Peseke, B., & Roscheck, A. (2010). Der Weg in die Zukunft - Energetische Stadtplanung Am Beispiel des Ehemaligen Straßenbahndepots an der Heinrich-Mann-Allee in Potsdam. Berlin: Universitätsverlag der Technischen Universität Berlin. Ranjan K. Bose. (2010). Energy Efficient Cities: Assessment Tools and Benchmarking Practices. Energy Sector Management Assistance Programme, World Bank, World Bank Publications. Sachs, W. (2005). Fair Future- Begrenzte Ressourcen und Globale Gerechtigkeit. Wuppertal: Wupertal-Institut für Klima Umwelt Energie. Saeednia, A. (2013). Municipalities Green Books.Urban Management, Organisation of Municipalities and Rural Governors Press, Tehran. Shieh, E. (1996). Introduction to Urban Planning. Tehran: IUST Press. Shove, E. (2003). Converging Conventions of Comfort, Cleanliness and Convenience. Journal of Consumer Policy, 26(4), 395–418. Statistical Center of Iran. (2011). Iranian National Census, Presidency of the I.R.I., Vice Presidency for Strategic Planning and Supervision, Statistical Center of Iran. Retrieved on January 24, 2012 from http://www.amar.org.ir/Portals/0/Files/abstract/1390/n_sarshomari90_2.pdf. UN-HABITAT. (2012). Sustainable Urban Energy, A Source Book for Asia. Nairobi: United Nations Human Settlements Programme (UN-HABITAT). United Nations Development Programme and DOE (Department of Environment). (2010). Iran Second National Communication to UNFCCC. National Climate Change Office at the Department of Environment on Behalf of the Government of the Islamic Republic of Iran. Retrieved on November 30, 2012 from http://unfccc.int/ resource/docs/natc/snc_iran.pdf. Wehage, P., Wolpert A., and Pahl-Weber, E. (2013). Young Cities Research Paper Series, Energy Efficient Homes for the Shahre Javan Community. Berlin: Universitatsverlag der TU-Berlin. Zamani, B., Arefi, M. (2013). Iranian New Towns and their Urban Management Issues: A Critical Review of Influential Actors and Factors. Cities, 30, 105–12.